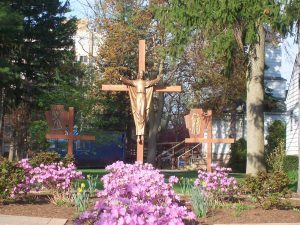 In 1936, Bishop James A. McFadden dedicated the outdoor Stations of the Cross and the surrounding garden on the property of the Sisters of the Incarnate Word and Blessed Sacrament as a place of reflection and prayer. Since then, countless people have walked our Stations in times of sorrow, times of joy, and in times of deep reflection with God as they meditate on the sufferings of Christ, and the sufferings of the Body of Christ throughout the world. In the spring of 2007 the Stations were refurbished. The renovation maintained the integrity of the original design with the 14 Stations arranged in a circular path. Each Station is represented by a 72″ tall cross with a bronze figure on a rough cedar placard atop the left arm of the cross. Below the right arm of each cross hangs a thick glass tablet inscribed with the prayer verses that were a part of the original Stations. Additionally, a large Resurrection Cross, marking Christ’s victory over death, stands as the centerpiece of the renovated prayer area. As one stands at the entrance to the Stations prayer area, you face a brick pathway in the form of a keyhole. The key symbolically reminds us that the key to Christian life is the call to take up our cross daily and follow Christ, the Incarnate Word. The area is landscaped to highlight the beauty and peace of the natural surroundings. 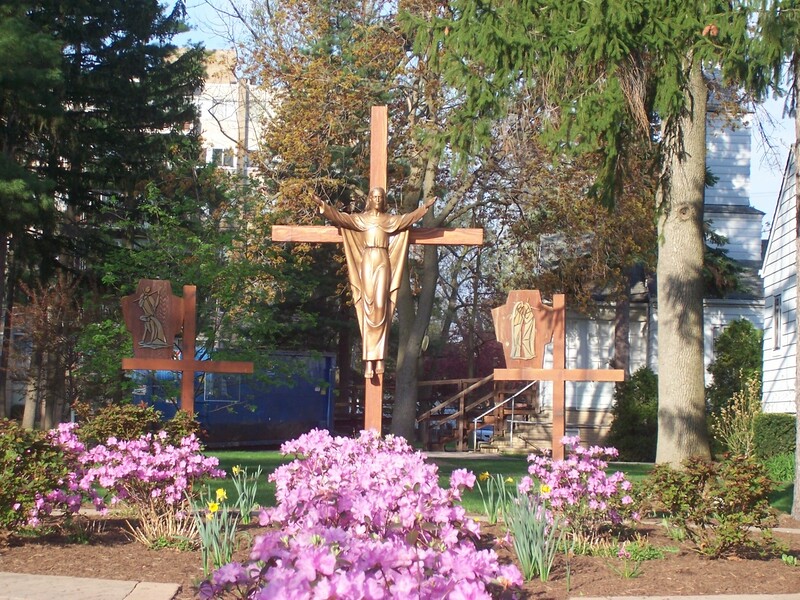 The Stations represent each of our lives – the mystery of our sufferings, sorrows, and joys. Praying the Stations also reminds us of God’s infinite unconditional love, mercy, and forgiveness – how we should live our own lives as Christians. As we witness people at prayer here, we are truly amazed at the peacefulness that surrounds them as they pray at the foot of each of the crosses. Often, we see weary parents, students, strangers and Sisters lay their burdens of care at the feet of Mary in Queen of the Holy Rosary Shrine. She, then, leads them to the footsteps of her Son, encouraging them to find courage and strength in Jesus’ acceptance of suffering on the way of the Cross. The simple but meaningful message at each Station brings hope and encouragement to endure and follow the way of the cross to the resurrection.